Halo lights, step lights, marker lights, etc. “It is a bloody enormous truck, unless you’re from Texas.” Meet the supporting cast of Spectre’s vehicular stars. Away from the A-list Aston Martin DB10 and its equally stunning Jaguar C-X75opposite number, the 24th James Bond flick will also feature some particularly sinister Land Rovers. There’s a 542bhp supercharged Range Rover Sport SVR, standard save for its street-illegal LED light bar. And then there’s the monster I’ve just about scaled. The Land Rover Defender SVX. Yep, the faithful, endearing ol’ Defender has grown horns and gone evil in its old age. First, I’ve got to actually reach the driver’s seat, which is somewhere around chest-height. 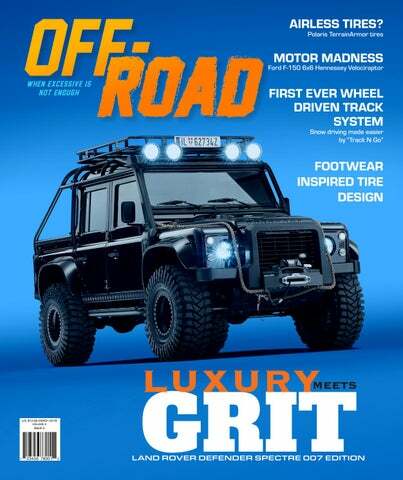 To create the aura of a Defender-gone-rogue that’s been modified by some massive organisation’s devilish skunkworks, Spectre’s creators got Land Rover to, well, do exactly that. They handed 10 Defender Double-Cab Pick-Ups over to Special Vehicle Operations, which has the roofless Jaguar Project 7 and batty Rangie SVR on its CV. Immediately it becomes glaringly obvious I’d not make a particularly potent henchman. By this point 007 would’ve long disappeared over the horizon in his Aston Martin, no doubt making a glib ‘step too far’ quip about ride height to his beautiful female passenger. Can Bond villains carry stepladders?